Okay, fine. It took only two weeks to fall off the theme-day thing. As two tribe members noted, Thursday Theme Day flew in the face of the spontaneity that defines “…the house…” Regardless, in short order it became a chore, self-imposed at that, and there is little reason to accept such discipline. He was brought to trial. The law in Athens dictated that such cases not exceed a day’s length and the old philosopher knew that he could not make his case in just a day. Instead he began to challenge the jurors. 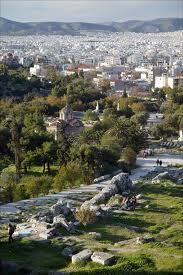 In essence, he claimed that the jurors (citizens of Athens selected by lottery) could hardly be expected to be sympathetic, as they had little appreciation for philosophy. His tone, as recorded in Plato’s Apologia, was reprimanding and unapologetic. 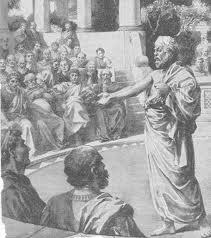 If Plato and Xenophon are to be believed, Socrates sought not to persuade, but to lecture and provoke. The law held that the guilty party had to kill himself, hence the hemlock. It was expected, and suggested by his followers, that he would flee. Most hold that he did not flee on moral grounds, that seeing the sentence through to completion was his moral obligation. And so it was, indeed. 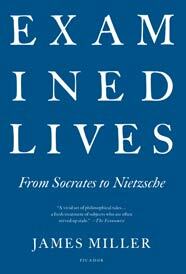 Socrates stated that the unexamined life is not worth living. I disagree with the fundamental premiss, the notion of a life not worth living; but that’s not the point. Inverted to the positive, Socrates’s admonition might be understood to read: The examined life is (more) worth(y of) living. He did not say, What is the meaning of life? ; rather he made a value statement on existence. He did not suggest developing a flow chart, or creating a matrix. There are no three-ring binders with tabs in this project. No Powerpoint. No life coach. He exhorted, in my shorthand, simply: Examine. Accept nothing less than an adequate accounting. It is an open and expansive thought. Conversely, drilled into us from childhood: seek and find, question and answer, open and close. Those are closed equations, for lack of a better phrase. For me, the power of Socrates is the open equation: examine. Although I’ve not read it, I understand that I.F. 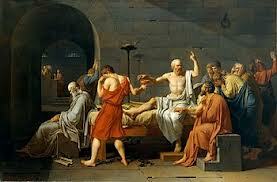 Stone’s The Trial of Socrates, is an excellent read if you’re interested in the history. Thanks for reading. I hope you found it interesting. If you’re a regular reader of “…the house…” you know of my obsession with the examined life. How to live is the question, and the study of “lives” is one fashion by which I attempt to find answers. That is, how have others answered the question and what does the examined life look like? Typically this pursuit turns to history, literature, philosophy, and biography. But there are contemporaneous lives I study as well, vibrant lives not yet covered with the dust of history. First among them is Yvon Chouinard. Chouinard is best known as the founder and CEO of the Patagonia company. He is widely recognized for his unique corporate style and philosophy, and his visionary environmental leadership. As a younger man, he was a world-class rock climber and adventurer. For a quick primer on the man and his philosophy, I recommend the current documentary, 180 Degrees South. (Available as streaming video on Netflix.) 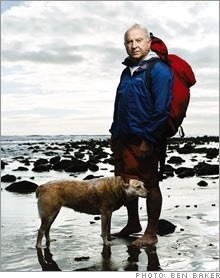 When pressed, I cannot think of a life that better wrestles with the question of how to live than Yvon Chouinard. I leave you a Saturday quote from Chouinard. Originally, my blogging intention was to make this my “workshop.” That was the word I used when I set out. It was to be a place where I would share a thought or two, write about a book I was reading, or explore an idea I’d encountered. It is all that, but increasingly, it’s becoming a journal of self-reflection. A person can be subjected to only so much introspection–what’s sometimes called navel gazing. I forgive you, reader, if on too many occasions I am exhausting your patience with my personal tribulations and confessions. I joke among friends that I am just a simple pilgrim, a man holding a lantern against the darkness of the self. It is a line guaranteed to get an eye roll. But joking aside, I am quite serious. The “urge to convert experience” runs deep in me, and its expression seems most satisfying when realized in the simplicity of the first person singular. That is my “urge” and how I express it. I share this because I think that, as a species, we universally desire a clarified understanding of the human experience. That is what, I suspect, is behind Larhiri’s urge. The manner in which this desire is manifested is as different as we each are different from the other. I have a friend who is a brilliant photographer. That is her way. Another friend is a deep and thoughtful reader. Religion is a direction for some, philosophy for others, physiology, poetry, music, dance, entrepreneurship, cooking, travel and so forth. Too, there is community, family and love. If pressed I’d say that all manner of human activity can be viewed this way, as an effort to better realize the human experience. Some of these activities are beautiful and shared and widely recognized for their truth-giving vision. Others are quiet, contemplative and personal. I am hopeful, that by way of explanation, my increasingly self-indulgent forays into the world of “I” will be forgiven. My previously mentioned interview with photographer Thatcher Cook has been published at Obscura. You can read it here. It is, in light of what I say above, an apt commentary on the creative life. While you’re there, you might want to read my thoughts against art. The article is called “The Existence of Art.” I do my best to put “art” in its place. Cynically, one might ask if Socrates, by drinking the hemlock–the death sentence imposed by the state, rather than arguing for clemency–presaged Camus’s existential challenge? Might he have failed in the examined life he sought? We know the factors leading up to his sentence. And we recognize the virtue–as he defined it, arete, an informed moral knowledge that sees with clarity–motivating the course he took. Yet, they are curious bookend observations. I am not a philosopher, not a historian, nor properly trained intellectual. I am a middle-aged man who has read widely, traveled widely, raised a family, started, ran and sold a business, sustained a three decades-long-and-counting marriage, escaped major illness and loss, loved dogs, privacy and leisure. I have no special training, no unique abilities. I have struggled through life like everyone else who has inherited no family wealth, no special calling, no unique talent. I have a good head on my shoulders and I have endeavored to make it better. A constant goal has been to find the world more interesting than I fear it truly is. This requires an approach that is at once creative without fancy, pragmatic without rigidity, fun without folly. In the main, I have struggled to mold a life that, at any time, should it end abruptly, I could in those waning moments of consciousness, reflect that it–my life–has indeed been full and well-lived. Life has not always been an engaging endeavor, but even when it wasn’t, even when its veneer was found dull and common, I believed that in some fashion, if I searched thoroughly enough, dug sufficiently deep, I would realize it to be more than it appeared at first blush. This motive for a life of substance has not been a random nor cursory adventure. It has been orchestrated. I drew it, as best I was able, specific to the canvas of my life, idiosyncratic and tailor-made. As Montaigne asked, What do I know? I have attempted to know myself. That was the admonition of the Greeks and it still retains a profound timeliness. I have taken it to heart. Ultimately, it is all I have.